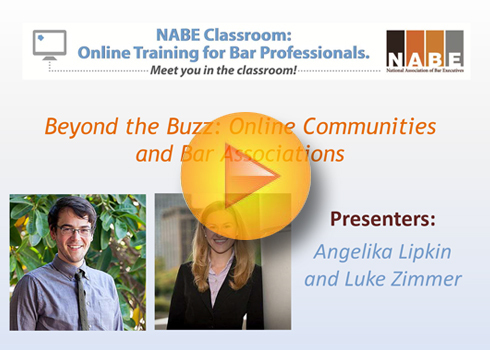 Join us for the National Association of Bar Executives’ revitalized online education programming! Resources, tips and cutting edge updates will help you—and staff members throughout your association office. Affordable, flat registration fees—register and invite your full staff to participate! During this session, learn how business plans can help bar association professionals plan for success, rather than just hoping a new product or service will succeed. Mark Your Calendars for these 2019 Sessions! Please follow the links below to purchase recordings of webinars or download webinar handouts. During this webinar, communications experts Farrah Fite, Matthew Page and Amy Starnes will discuss how a thorough crisis communications plan can direct action and keep bar leaders focused on a clear path through any disaster — man-made or otherwise. You'll learn the do’s and don’ts from these communications crisis plan pros who have faced crises and survived. Mary Byers leads this exciting presentation where you will hear about what to do when you are being outpaced by change, an agricultural association's member challenge and the change they created, and how pricing and packaging experiments are essential to your future. Other topics covered are: promoting experimentation so volunteer leaders come to expect it; and how pricing and packaging experiments are essential to your future. 2019 could prove eventful for our organizations from court decisions impacting the status of the mandatory bar to advances in technology and mischief-making in legislative chambers. 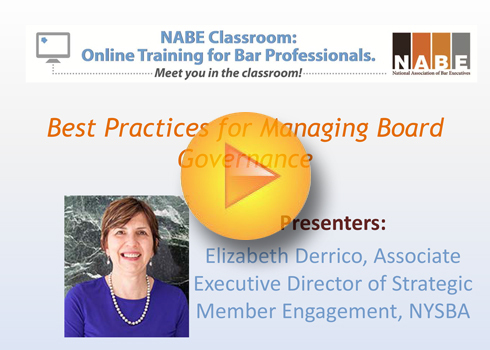 Bar associations large and small, voluntary and unified will want to participate as this NABE Classroom program takes a look at the year ahead with a dynamic panel of colleagues. Lawyer engagement is a changing landscape. This session features an enlightening conversation about with association leaders who are providing new opportunities to lawyers, helping them grow as professionals. Hear about association programs that teach social media skills, give advice on writing press releases and award submissions, and other value-added programming that meets new member needs and continues to increase association relevance in the legal community. In this presentation, speaker Sam Glover, Founder, Lawyerist, will discuss how bar associations can play a role in helping small or solo law firms succeed. Sam will cover: the challenges solo and small firms say they face, identify the obstacles preventing firms from taking action to move past those challenges, and share a free tool that will help solo and small firms attack their challenges methodically. A FREE webinar session featuring speakers Jennifer Lewin, Deputy Director, and Molly Kilmer Flood, Research and Information Manager, from the ABA Division for Bar Services. Jennifer and Molly will walk you through an overview of the valuable resources available to your bar association from Division for Bar Services and throughout the American Bar Association. 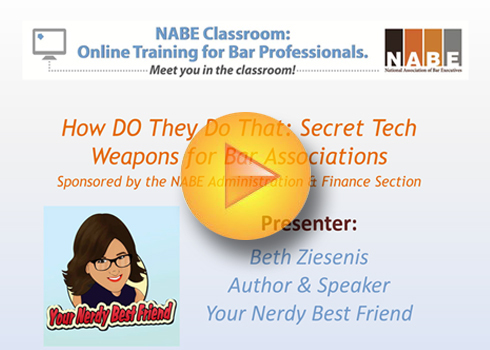 This insightful webinar, sponsored by the NABE Administration & Finance Section, is a great resource for all your bar staff. Speaker Ryan Robinson, Chief Service Officer at Mainstay Technologies, discusses the nature of threats and why they are increasing including email phishing, social engineering and ransomware viruses. You'll learn about the compliance requirements that bar associations need to be aware of from PCI to HIPPA, to HITECH. Strategies to protect both your staff and members will also be covered and include: comprehensive security risk assessments and compliance audits, user training and phishing testing, dark web scanning, organizational policies from acceptable use to data access, utilizing organization-wide password mangers and multi-factor authentication, and cyber liability and cyber-crime insurance. 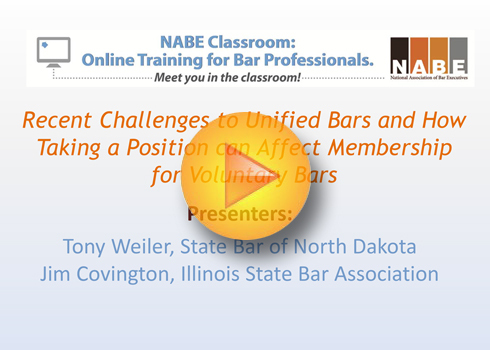 This webinar provides insightful information on how bar associations can ensure that they are accessible to members, the public and employees. Speaker Pamela Hoopes, Deputy Director/Legal Director at Minnesota Disability Law Center, will cover: the basic legal framework for accessibility; facility accessibility (both onsite and for private and public off-site events); programmatic accessibility for individuals with various needs; accessibility of online and printed materials and service animals. She will also discuss proactive steps to improve accessibility, such as self-audit, and recommended resources that may be available in your state. The latest National Labor Relations Board developments change the employment landscape for your organization, even if you are a non-unionized employer. Find out the specifics during this webinar session with speaker Harry I. Johnson, III, labor and employment attorney at Morgan, Lewis & Bockius LLP. 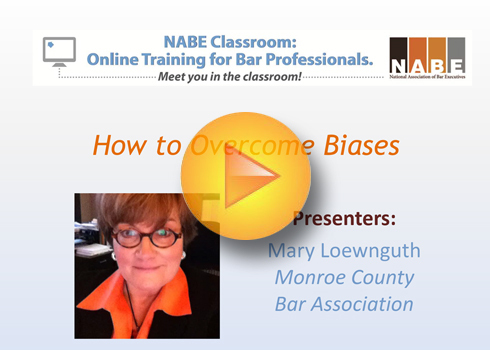 Please join your colleagues in the NABE Classroom for this June webinar session which will be broadcast live from the NABE 2017 Small Bar Conference! Michele Haggerty, Legal Community Specialist from Retreat Premier Addiction Treatment Centers, will provide insight on understanding the issues underlying and resulting from substance dependence abuse. Michele will also share examples of programs and policies implemented by bar associations that have helped bar association members help themselves. During this webinar session you'll hear from three seasoned bar association professionals on shifts their association is taking and some tactics to better retain members. Presenters will share their "ABC's" when it comes to retaining members: Acknowledge member value, Beat member expectations, and Create member dependency. Please join us for insightful conversation. Do you know how your eyes close during a presentation, as your mind drifts toward the days when you thought learning could be fun? Yeah, us too. We hear more and more about how people are visual thinkers, but PowerPoint largely remains a land where text is king. Tim Eigo will share some ways to depose that monarch and help engage your audience. 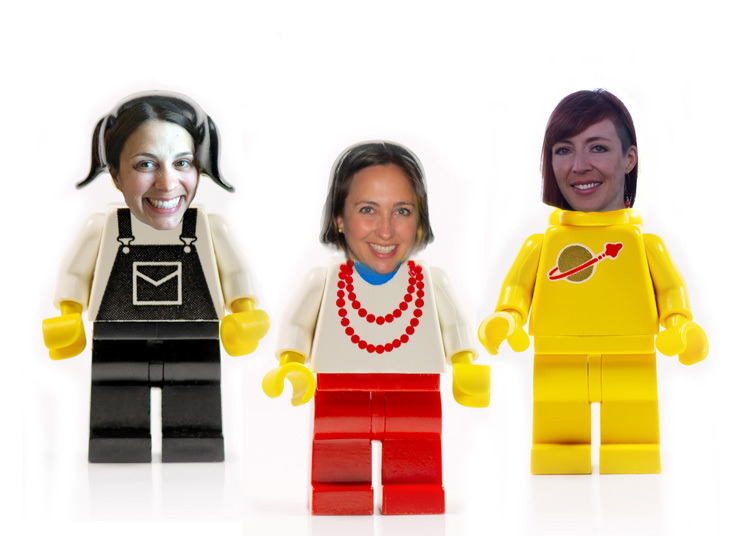 Make gamification work for your bar association! By learning how to carefully and intentionally use gaming techniques, you can increase loyalty, enthusiasm, and engagement. Implementing a gamification framework for your organization creates new opportunities for leading, learning, and living and can amplify intrinsic and extrinsic motivation. Leave with practical ideas on how to use gamification in strategic planning, member recruitment and retention, volunteer achievement, events, education, and certification programs. Are you – and your members – getting tired of the same old “Lunch and Learn” programs in the same too-costly venues? Find out how other bars are finding less expensive, more functional space for CLE presentations and how they’re using gamification and other creative techniques to infuse energy into programming. 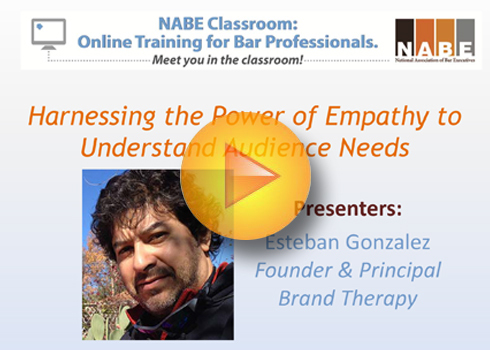 Whether your bar is large or small, if you do CLE this webinar is for you. What happens when you have a shoestring budget, a lot of ideas, and want to communicate more effectively with your members? You launch a podcast! In this webinar, Craig Sorrell will take you through the journey of his own successes with podcasts, including some mistakes he learned along the way. Learn how to start your own podcast, and even learn some advanced techniques to make your voice flourish in a world of on-demand entertainment. Craig will discuss everything from basic set up to hosting. Explore how you can leverage this tried-and-true, old-is-new communications format — and generate revenue along the way. This session is FREE as part of the NABE 75th Anniversary celebration. Ten years from now, as we travel to work in our self-driving cars, the issues we ponder on behalf of our bars will undoubtedly be much different than our past concerns. Just as other industries must recognize and adapt to innovation and disruption or else go the way of the dinosaurs, bar associations must be poised and prepared to not only embrace but harness the opportunities that great change presents. From technology to governance, our panel of experienced bar execs will share their perspectives on the future of bar associations and what we can do now to be prepared down the road (the road full of self-driving cars, that is). APRIL 2016: Social Media: It's More Than Likes! By now, we all know that social media is more than just animated gifs and memes. These tools represent a powerful way to connect with members and promote our mission. But are we using them to their full potential? With the right strategy, association social media can play a major role in grassroots advocacy efforts, helping staff throughout the bar achieve goals and celebrate success—all at little to no cost. 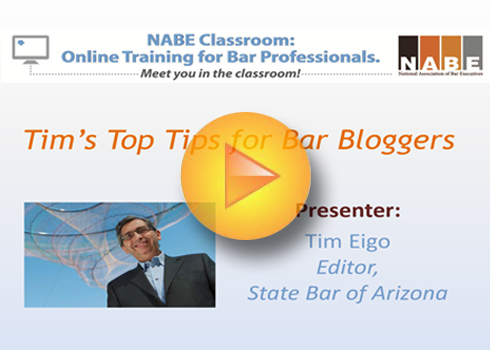 Rick DeBruhl, Chief Communications Officer at the State Bar of Arizona, will share his experiences and invaluable tips at this upcoming NABE Classroom session. Is your level of graphic design knowledge limited to the options in Word clip art? 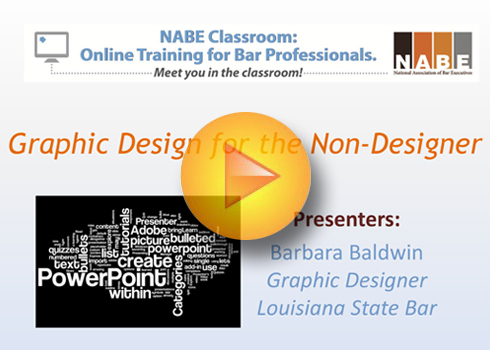 This webinar will teach graphic design for the non-graphic designer! Whether you’re interested in making web banners, invitations, infographics, mailers or general marketing pieces, this webinar will provide the simple design tools and tricks that will add professional polish to everything you create. What if you could announce a workshop with a multimedia video that you created on your phone in minutes? Or schedule a council meeting without having to send three dozen emails to find a time everyone could meet? Or automate your little tasks that keep you from your real work? And what if you could pull all this off straight from your mobile device—without an IT degree? *Please contact Nora Warens or Rebecca Green-Jablonsky if you would like the full version of this presentation that includes multimedia and animation.